This white 25mm pin badge is for the Geeks. 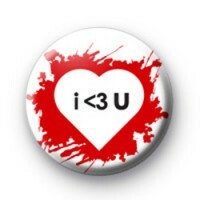 Its in text speak & says I <3 U which if you're not familiar is simple I Love You. Its fun, modern and quirky and yes even a little nerdy which we think is cool! It is a fun way of letting that special someone know just how you feel. So why not share the love this Valentines Day, or any other day of the year. We have a whole Valentines badge category with hundreds of sweet, romantic and love themed badges, we also have some Anti-Love badges if that's more of the mood you are in.